A great post! I really like the simplicity of your example (and downloadable workbook). Thanks. I’m going to be able to use this technique a lot! We do a lot of inventory analysis, and TopN/BottomN is a frequently requested feature. Thanks Chris. I’m glad you like my example. Great post George! I would like to try this on one of my data sets but I am not able to download the file from the supplied link for review. Once I click on the link OneDrive just clocks and does not pull anything up. Any thoughts? Thanks, Patrick. Make sure the firewall is not blocking the OneDrive. Ill double check the link when I get to office. I am facing an issue. If I have duplicate IDs (ie, returning customer performing another sale), I am unable to get the aggregated sales from the returning customer. Instead the above, it will rank the highest sales from the same customer instead ranking the AGGREGATED sales from the same customer. Wondering do you have any pointers for this. 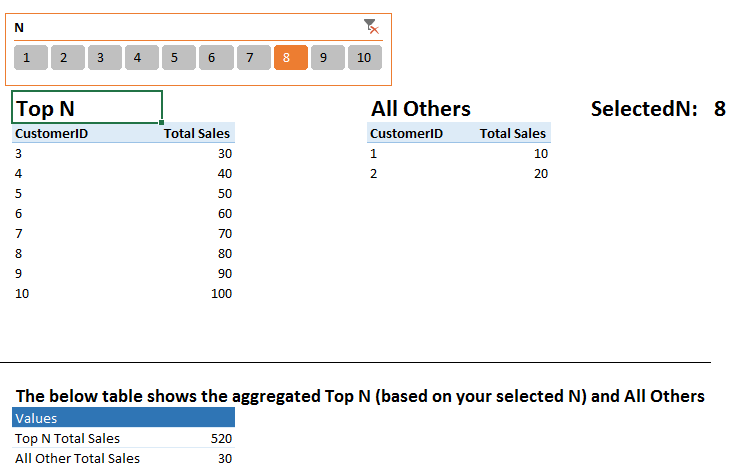 I would suggest you perform an ETL to make sure the table contains proper data to perform the aggregation. Cleanse the data in ETL is much much easier in Power Pivot data model. @Alvin – Did you figure out a solution? I’m having the same problems as you. I’m not the greatest with Excel but I’ve been asked to create a report that needs data represented in this exact way. Do you use standard pivot tables to achieve this or do you use an add-in? At the moment I can’t create sets and I’m wondering if it’s due to not having a particular add-in activated? Apologies! After digging it looks like Power Pivot is only available in 2013 standalone and professional+ but I’m currently running standard. when i try to replicate the rank and top n total sales i get an error message in the measures.